Puffin Picture Books to me had it just right. Their illustrations were things of simple beauty. They weren’t in any way child-like, quirky, or hitting a particular, temporary, zeitgeist. The illustrations of the only Puffin Picture Book I had as a child (Henry Wynmalen’s Riding for Children, found at a Methodist missionary society jumble sale) gave me a sunlit, rural world in which lived a perfectly behaved grey pony, and a kind and expert instructor who gave considered and elegant riding lessons where you had no need to wonder why you were being taught the hands-in-lap show ring style that had been out of fashion for decades. The first books appeared in 1940, and despite what Lane wrote, focused firmly on contemporary events. Three of the first titles, War on Land, War at Sea and War in the Air, took children into the heart of the war rather than sparing them from it. But Carrington was eager to embrace his passion for nature, and books addressing current events were, in the main, shelved for a series of mostly factual books, all in the same format, twice the size of a Penguin paperback. Unlike the Puffin story books, all the titles were specially commissioned. Out of the 120 Puffin Picture Books printed, there were six that have some horse content: three story books and three factual books. Carrington maintained his record of giving children the best by commissioning the famous sporting artists Lionel Edwards and Michael Lyne to illustrate (and write, in Edwards’ case) two of the books. Artist and naturalist Professor Allen Seaby wrote the third, Our Ponies, which appeared in 1949. Henry Wynmalen wrote the text for Riding for Children (1949). Wynmalen was a particularly inspired choice. He was a proponent of the continental style of riding that aimed to be in harmony with the horse, rather than produce a rider who could stick on the horse, at whatever cost, as it charged down the hunting field. Riding for Children was his only children’s book. It takes beautiful, grey Silver (because greys always have a particular fairy tale charm their darker cousins do not necessarily have) and takes his rider through a series of riding lessons, all illustrated with rare charm by Michael Lyne, a talented sporting artist. The other two factual books covered British breeds of horse and pony. Allen Seaby had, by this time, already written and illustrated a series of story books about British native pony breeds, such as Dinah the Dartmoor (1935) and Skewbald the New Forest Pony (1923). Our Ponies (1949) covers most British breeds of pony (the Irish Connemara is missed out). Lionel Edwards, the author and illustrator of Our Horses (1945) was one of the foremost equine artists of his generation, whose books and paintings still command high prices now. Our Horses is a short, but thorough look at the horse in Britain, encompassing working horses and riding animals, their breeds, equipment and gaits. Sadly, for copyright reasons I am unable to show you a picture of this book, but if you ever find one, pounce upon it and make it yours. It is a gem. Hamish gains courage from reminding himself that he is a Scottish pony, and he frequently encourages himself with cries of ‘Scotland for ever!’ Sadly, he only speaks Gaelic, which no one around him speaks, and it is not until he meets another Gaelic speaker that his problems are resolved. It’s tempting, if fanciful, to posit Hamish as a representative of the many people who were displaced during the war, and who found themselves strangers in a foreign country. 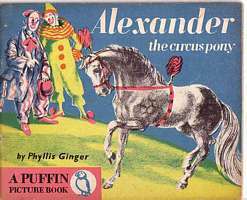 Phyllis Ginger’s Alexander the Circus Pony (1943) and Diana Ross’s The Story of Louisa Who Loved Pretty Things (1944) are both stories involving circuses, and like Hamish, aimed at the younger child. Alexander the Circus Pony is rare and expensive and one has never crossed my ken. Louisa, Who Loved Pretty Things by Diana Ross, which appeared in 1944, is a simple and moral tale of companionship and loyalty. Louisa's noble, and poverty-stricken, owner releases her so she can go in search of the pretty things she loves. Louisa resolves to take no job unless they will take her old master too, and eventually manages to find one for them both in the circus. What all these titles had in common was that they did not talk down to their readers. The Picture Puffin Books paid children the compliment of assuming that facts did not need to be simplified or edited; simply explained well with illustrations that complemented and developed what was presented in the text. I'd forgotten that I'd got both Riding For Children and Our Ponies, earlier this year. I spotted them tucked away in a bookcase yesterday and got them out to enjoy looking at them again last night. I hope you enjoyed them. I hadn't had Horses out for years either, and it was a real treat to look at it again. I wondered why they hadn't asked Lionel Edwards to do Ponies, but on balance I think Seaby was probably better at drawing ponies! All LE's tend to look a bit breedy even if they're supposed to be scruffy, hairy and just off the moors.